Lucy Fletcher directed this Agatha Christie adaptation with Ed Langley, and they take first credit for achieving a coherence and fluency in ensemble performance, which at its best moments when the motor was purring - and there were plenty of them - drew us all deep into a mystery with a twinkle in its eye. The directors had made very best use of the excellent hand they had been dealt at auditions, and a general assurance and commitment onstage suggested that they had skilfully combined encouraging each individual journey to character formation, with setting clear collective goals. The characters were an entertaining farrago of frailty, deceit and concealment. I got the hang of it when the relationship between Julia (Jennie Francis exuding poise and vivacity) and Patrick (a whirlwind of grinning flamboyance from Nick Livesey) took an unexpected turn; I couldn’t decide whether the final resting-place of his upstage hand in their clinches was modern or post-modern. Of the two characters who seemingly died from gunshot or poison, Kevin Leech gets a perfect ten for his nigh-wordless demise as Rudi, whilst Carol Coyne’s witty performance as Dora cleverly set me up to wonder what devious racket might be playing out behind her dotty facade, and whether she might not rise again, phoenix-fashion. Poppy Verkaaik as Phillipa gave such an effective study in unease that my Cleudo notes had her down variously as possible killer or possible bait. Then what were we to make of mother and son from next door? I ruled out Sue Grindlay (Clara) or Kevin Smith (Edmund) as sole perpetrators, but her jolly noseyness and his air of savoir-faire seemed to point to something - which turned out to be a police trap for the killer. Mitzi the maid, played for all the part was worth and then some by Sarah Leigh, was too much of a mood maelstrom to be a credible suspect; impossible to imagine that she could ever have kept her mouth shut. 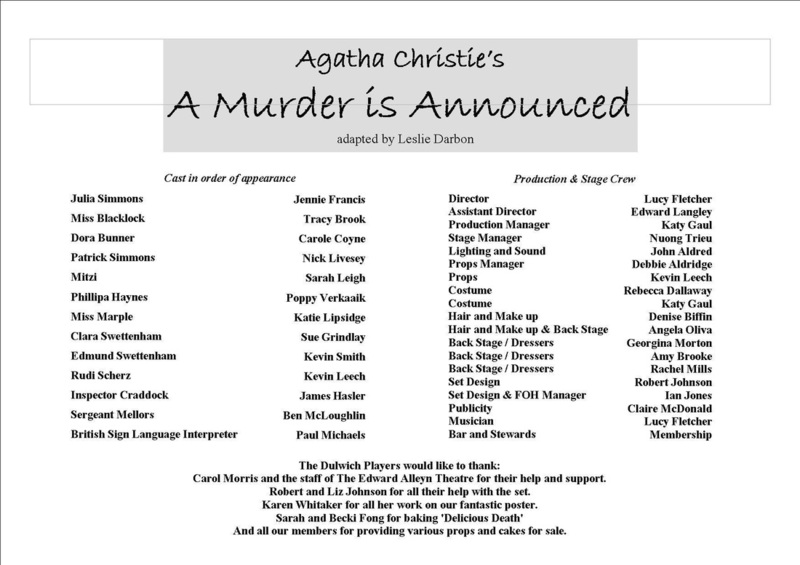 Which brings us to Miss Blacklock - who dunnit - an evidently scheming and controlling person; but Tracy Brook’s adroit performance created an ambiguity about her motives which kept our suspicion in check - until Miss Marple and her policemen sprung their trap. James Hasler as the Inspector was certainly every inch the shire county detective, moving easily with the ebb and flow of morning coffee and afternoon tea, but stern enough in action to command the boisterous Mitzi into the naughty corner. But in time-honoured fashion, his constabulary twosome with Ben McLoughlin’s stalwart Sergeant was long on hunches and short on proof; so thank goodness for Miss Marple, whom Katie Lipsidge skilfully invested with a mix of watchfulness, assiduous curiosity and calculated innocence. At the denouement when Miss Blacklock tried to add her to the body count with a Dresden table-lamp, I had a delicious feeling of cathartic frisson, accompanied by elation that good had triumphed over evil and we’d soon be in the bar. Pausing on the cusp between on-stage and back-stage, I want to commend Paul Michaels, the British Sign Language interpreter; an excellent enhancement to the Dulwich Players offering. The team responsible for inanimate décor - set designers Robert Johnson and Ian Jones, lighting and sound supremo John Aldred, props manager Debbie Aldridge and stage manager Nuong Trieu - managed to deliver a set like the best kind of supporting player - solid and dependable, presumably not too expensive, but with coy delights of its own, such as the glimpse of garden to be seen out of the window. And what a treat for the cast to be dressed, coiffed and made up in such authentic but distinctive outfits; the 50s were stylishly evoked in costumes by Rebecca Dallaway and Katy Gaul, and in coiffure by Denise Biffin and Angela Oliva. And so finally to the directors, thank you Lucy and Ed for spot-on casting, nifty air traffic control, adroit staging of those curtain-fall moments of high drama…I could go on, but instead will venture to hope that it won’t be too long before you step up to the mark and direct for the Players again.